The purpose of this project is to examine how volatile organic compounds (VOCs), such as tetrachloroethene (PCE), that migrate into multi-story apartments with concrete floors from subsurface sources may attenuate between floors. Ultimately the attenuation factors between floors may be important in allowing residents to occupy spaces at higher floors in an apartment complex. The figure shows a conceptualization for a two-story apartment. 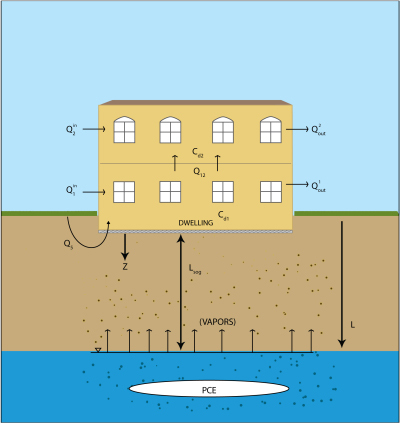 PCE vapor from a presumptive groundwater plume and/or contaminated soil volatilizes, diffuses through the unsaturated zone, and migrates into the apartment through small cracks in the slab (or other available openings). Once vapors enter the first floor, the vapors mix with the indoor air, exchange with outdoor air, and potentially further intrude into the second story. This example apartment has a slab-on-grade foundation, which can be below grade as shown in this particular example. There is air exchange between the first and second floors, as well as air exchange between the outdoor air and each of the two stories. However, preferential pathways between floors (such as stairwells) are assumed not to be present in these apartments. The vapor concentrations can be different between floors. This particular rendition of a two-story apartment and the surrounding environment is generic, and does not represent any specific apartment in Naples. Specific information about apartment construction and floor construction in Naples was not available during the course of this analysis. However, by specifying or calculating the size of the building, air exchange rates, building foundation types and other data, this model can simulate different apartment types that use different construction materials. At present, site-specific data are unavailable to simulate a specific apartment; therefore, the present analysis is an approximation and only predicts indoor air concentrations within an order of magnitude.